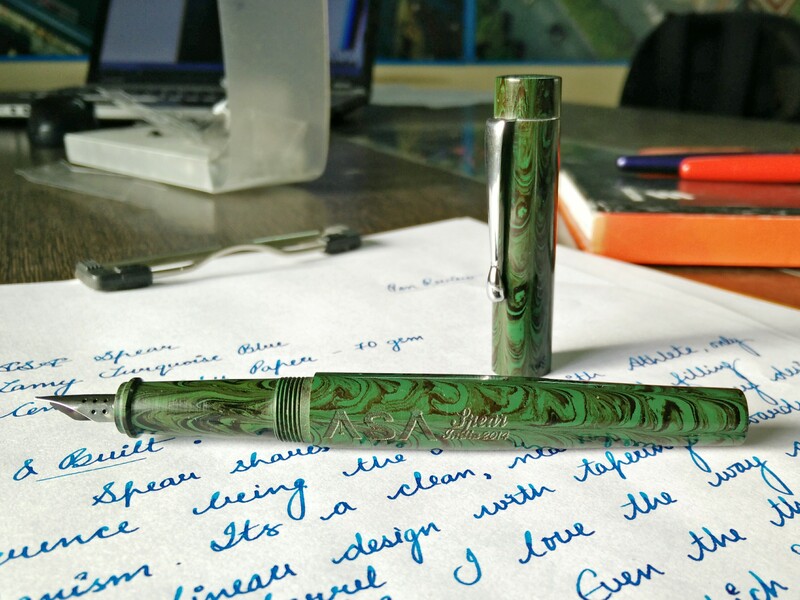 This review was long due for the first pen I bought from ASA stable. 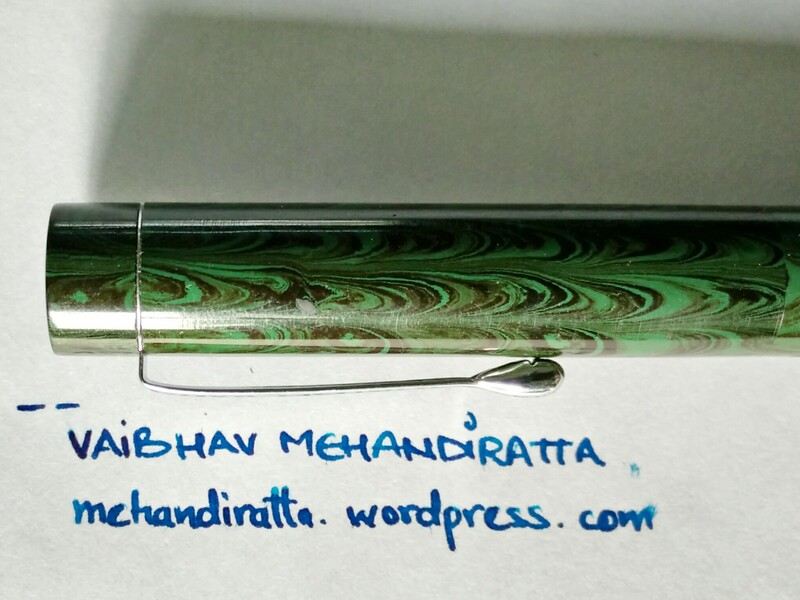 I have bought few Gama pens and Pilot pens from ASA prior to buying this. 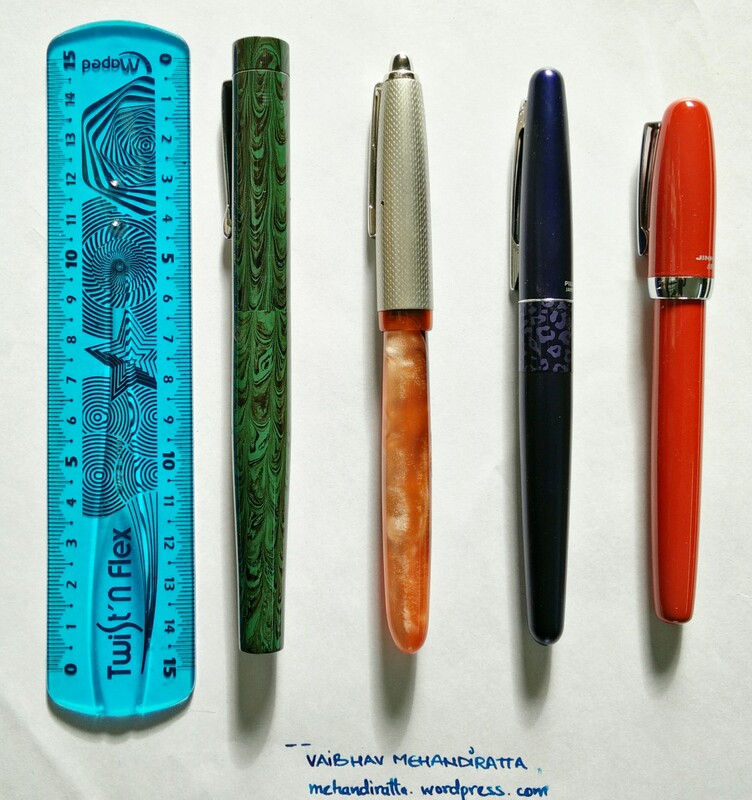 There are certain pens which u look at and just buy. YES SPEAR was an impulsive buy and the day it was launched i just immediately placed an order and have been using this pen for past 6 months on and off. 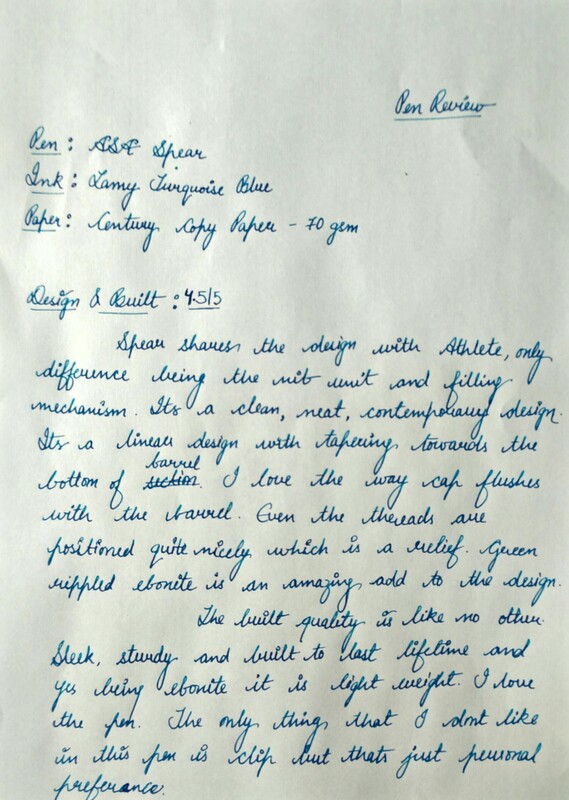 So this review is an detailed review of the ASA Spear. The Spear was an upgrade to the ASA Athlete, though they share the same design but the major difference lies in the internal mechanism. Design wise its a clean, subtle and yes contemporary. Its a linear design which tapers down from mid of barrel to bottom of barrel. I love the way Cap neatly flushes with the barrel. Simply Love it, very Neat. 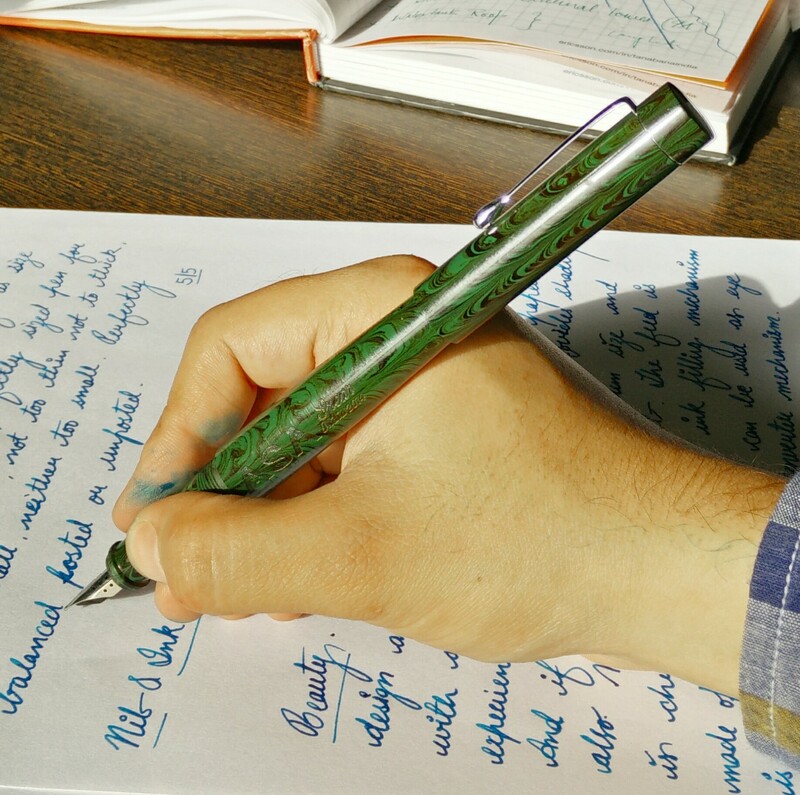 The section length is long and thus it helps people who hold the pen a bit higher without any obstruction of threads. 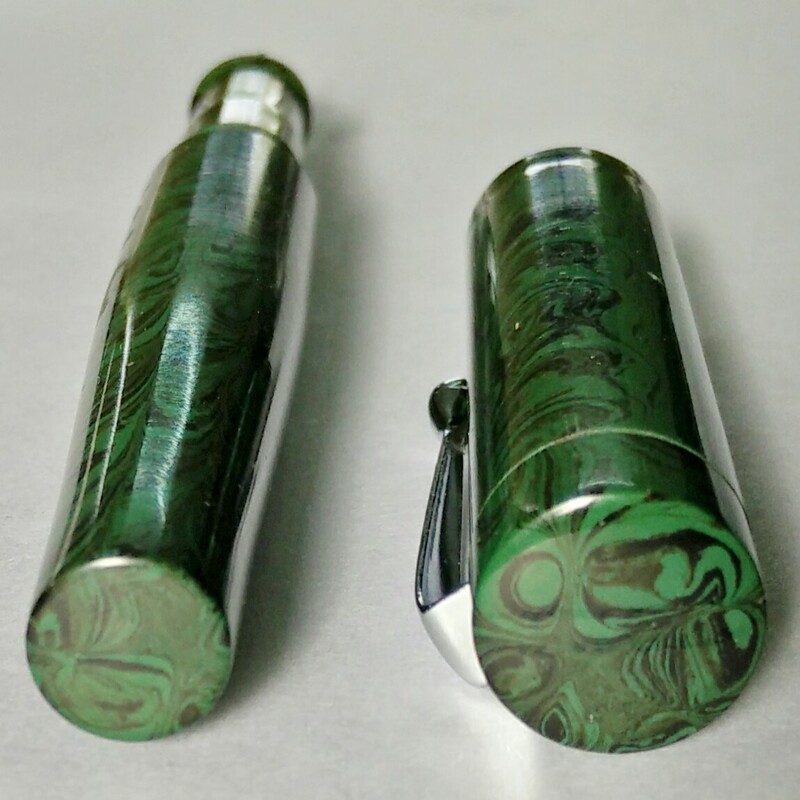 The green rippled ebonite looks premium and amazing and actually adds to the design. 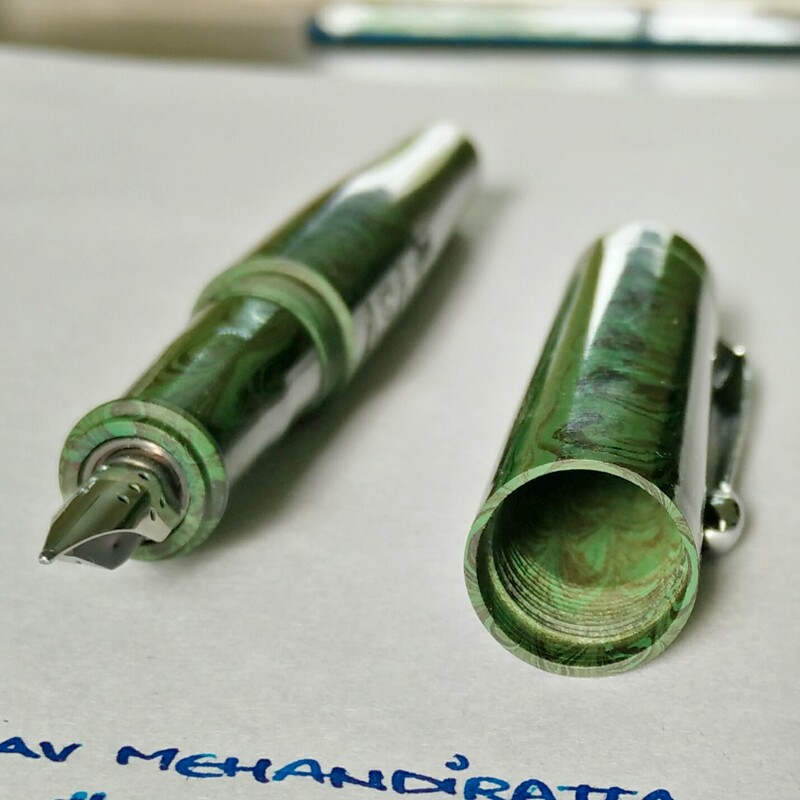 I bet the matte finish also looks amazing which you can see in my other pen Patriot. The pen opens in 4 turns which is not bad. The cap top and the bottom of barrel have flat clean finish. Even the edges are very neatly finished. As far as branding is concerned it is big and bold and engraved, I actually am not a fan of this big and bold branding and yes the seller has taken a note of the same and the are new models coming with very good and smarter branding which I personally like. The Built quality is like no other. Neatly executed an well finished pen. Its sturdy and built for a lifetime and yes being made of ebonite it is not that heavy and has a certain character which attracts you. 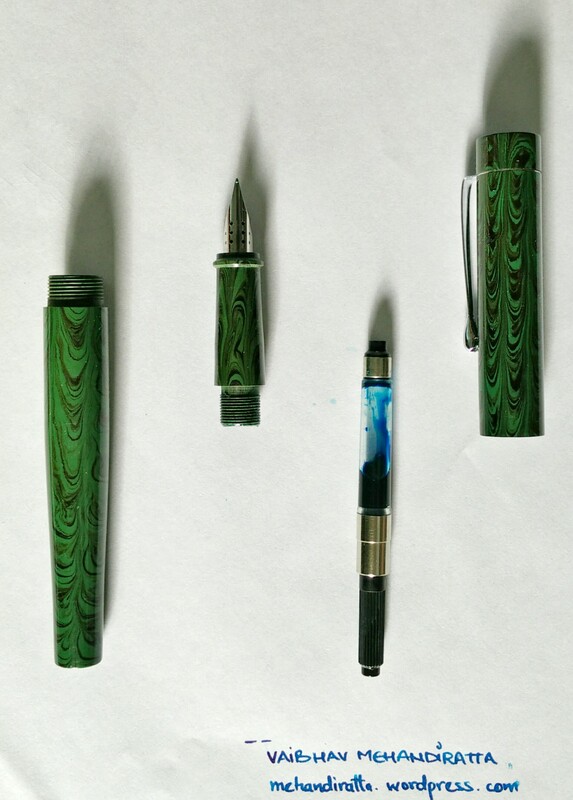 The pen cap top and barrel bottom are flat as shown in image below. The only thing I did not like about the pen is the Clip design. I just wish it would be flat clip design. However that being said the clip is sturdy and springy but is not too tight. The pen tends to slide in my shirt pocket as clip is not that tight enough but holds well on thicker cloth like trouser or jackets etc. The cap has a breather hole also to avoid moist deposits inside the cap. So that nib can breathe i beleive. Which certain times results in ink drying in certain weathers. 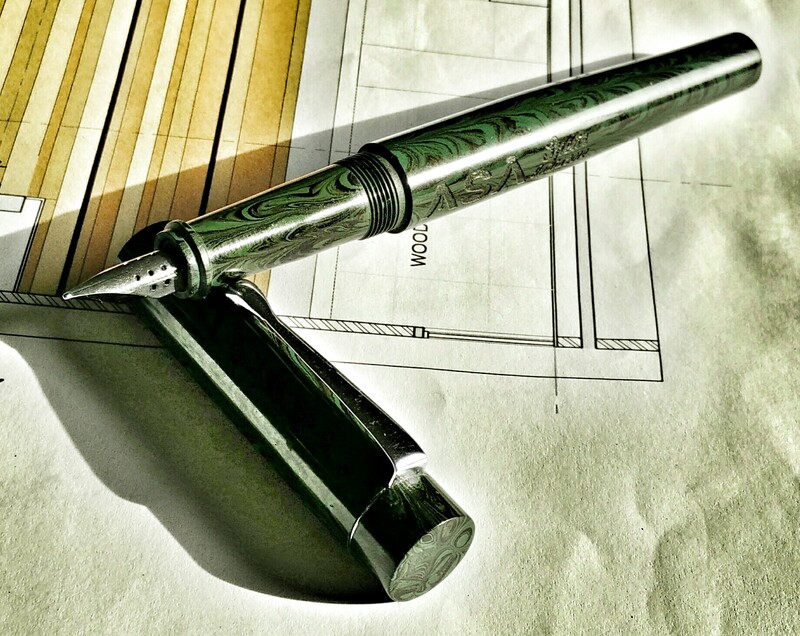 The section thickness of material is apt for the size of pen and gives it sturdiness. Now coming to the size of pen it is regular sized pen. 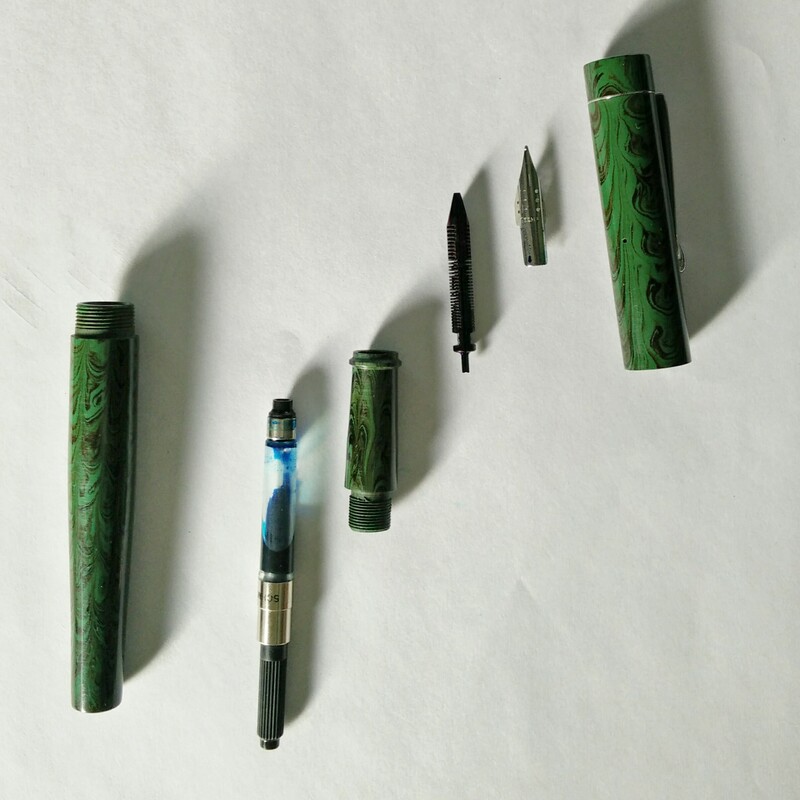 Actually just above the size of the Lamy Safari.Below are the few images showing the comparison with other pens. I love the green rippled Spear. I bought it only for design and looks. Turns out it writes well also. It has perfect thickness, slenderness in the Barrel and perfect length. 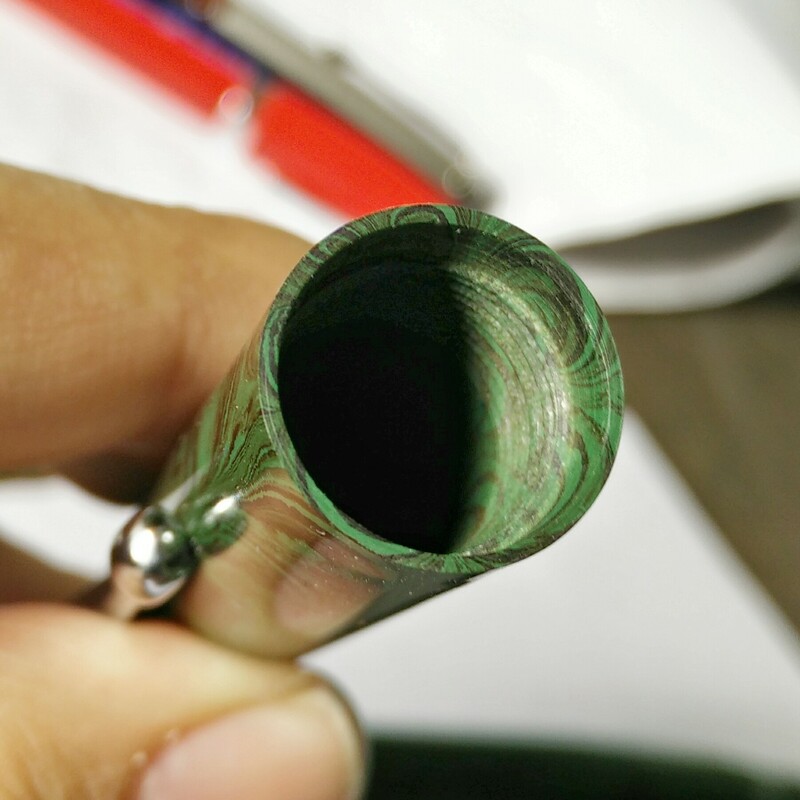 Dia of barrel is 14 mm and length of pen is 150 mm and length of section is 30 mm (which i like because i hold pen a bit above on the grip section and generally my hands touch threads, but on this case). Its a perfect size pen for both genders and all different sized hands. Trust me you will love the feel of pen in hand. 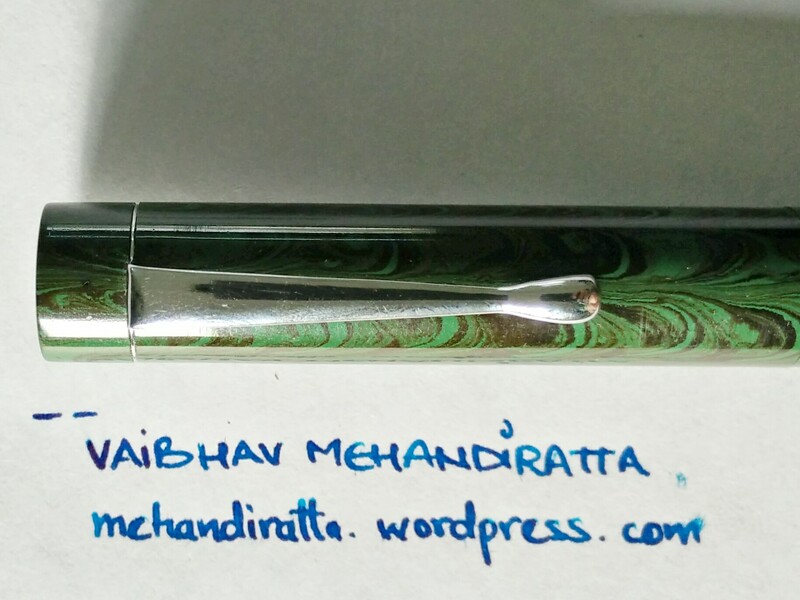 The size, the weight, the slenderness of pen is just apt. Large sized and hands would love to post cap and no problem there, cap posts securely at the back and provides certain heft which people with large size hands will love. Perfectly balanced whether cap is posted or not. Love it. 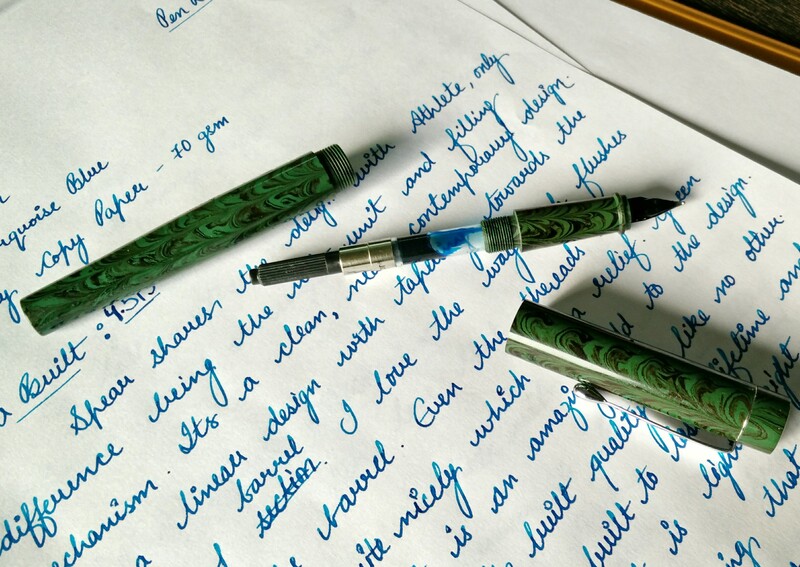 Ohhhhhh….. You will love the design of nib. Yes this is what separates mens from boys. This is what separates it from ASA Athlete. 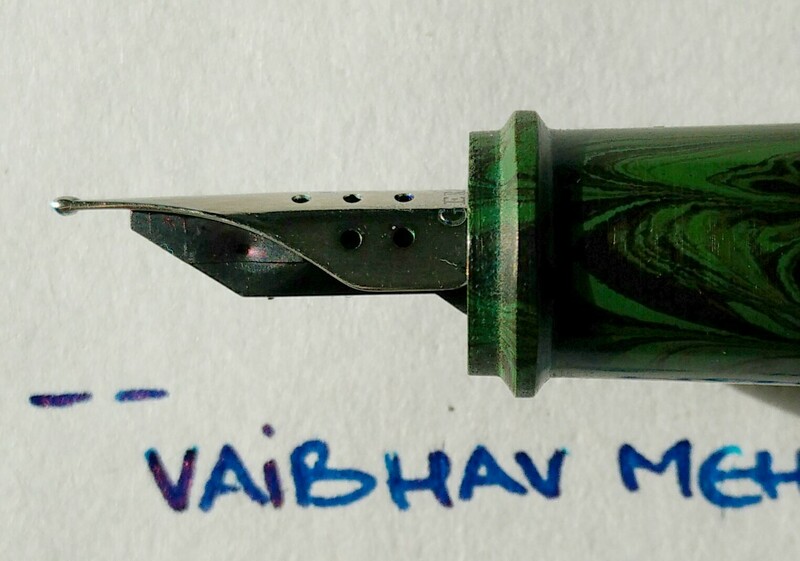 Athlete had something missing and yeah this 10 breather hole Medium nib, Designed like arrow is the solution. This nib, made of steel and chrome polished, comes in medium size only and really adds to the beauty of pen. Its a stunner to look at.The feed is made of plastic. 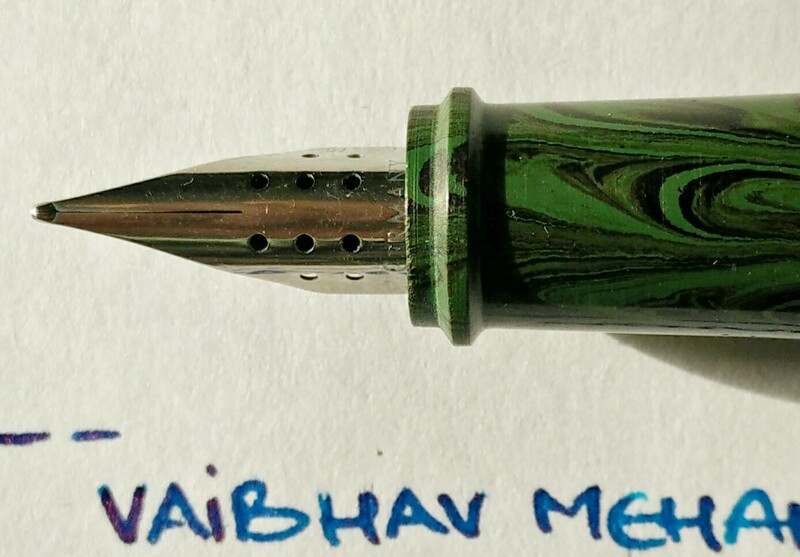 The complete nib unit is made by JoWo,Germany. 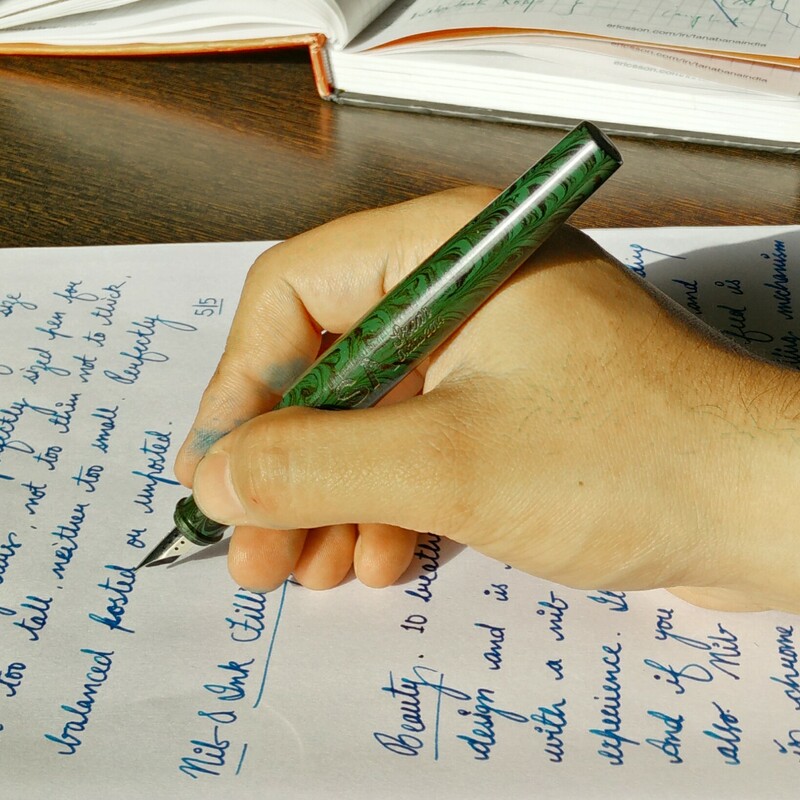 Writing with nib is all together a different experience. 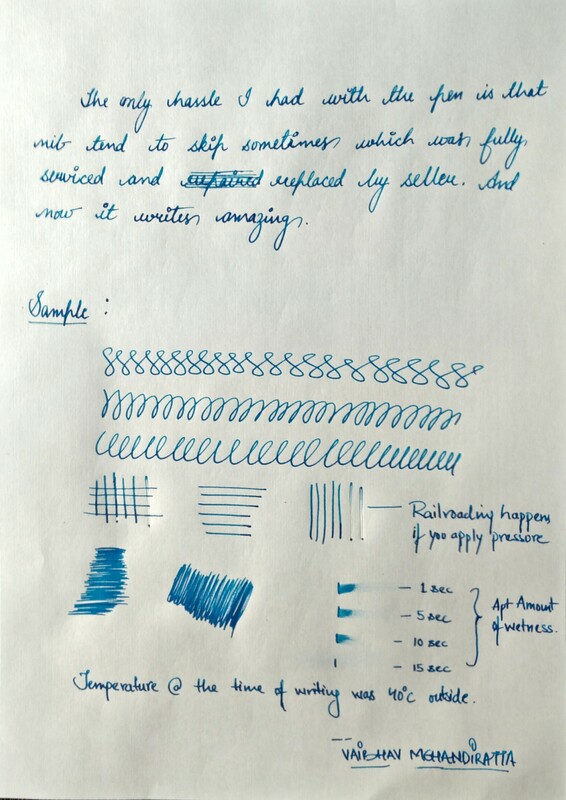 It writes on any paper without any hassle.And if you look closely on written sample, it provides certain shading also (You can see in above image). Ink Filling mechanism is triple filling (3 in 1) i.e. Eye Dropper, Cartridge and Converter. Which gives you liberty to use the way you want. The pens comes with Schmidt converter. International cartridges and converter are accepted by pen. The pen can be easily taken apart into every part as shown in below two images. 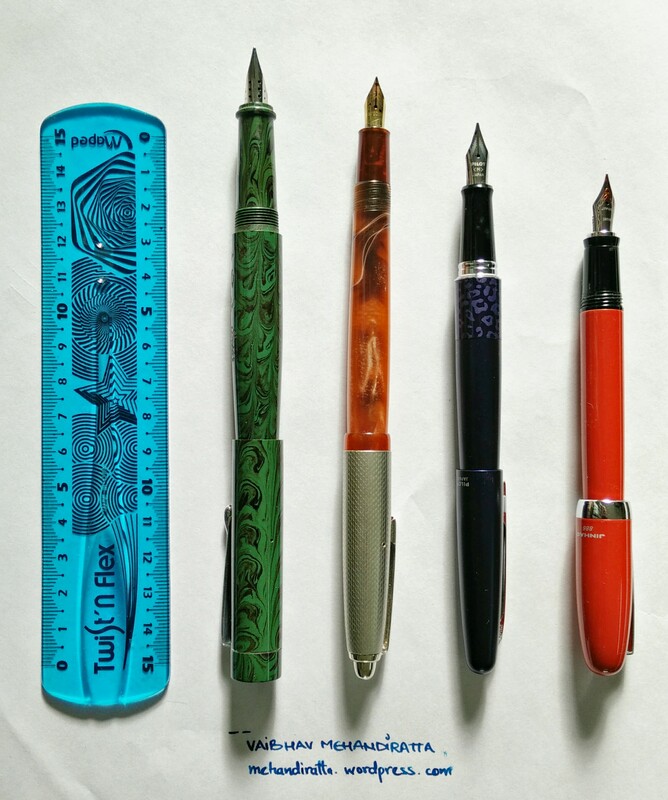 The only hassle i had with my pen was that nib tended to slip which was replaced by seller ASA Pens easily. So assurance is there as far as the seller is concerned. And now my pen writes like a dream. 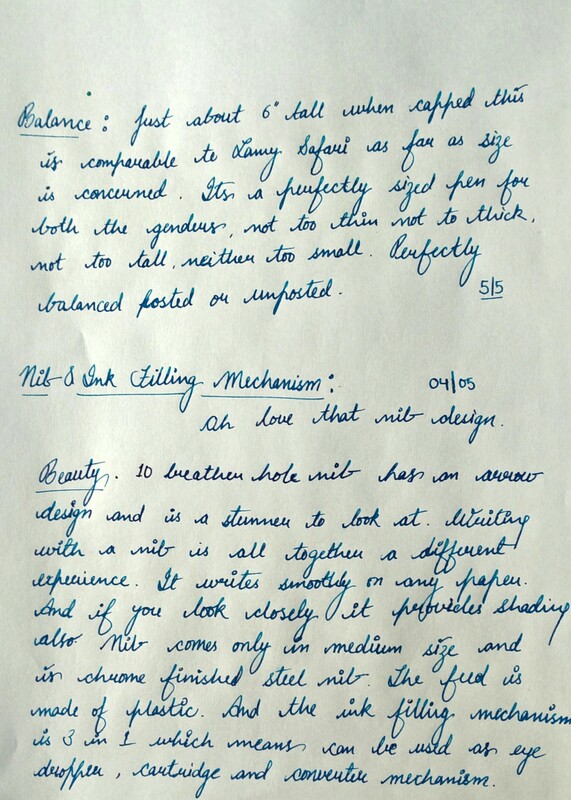 Below is my handwritten review with sample which might give you insight on writing samples with the pen. You wont get a pen of this kind at such a rate elsewhere. Love it. I recommend its a necessary addition to collection. People who are on short of cash can certainly try out ASA Athlete. 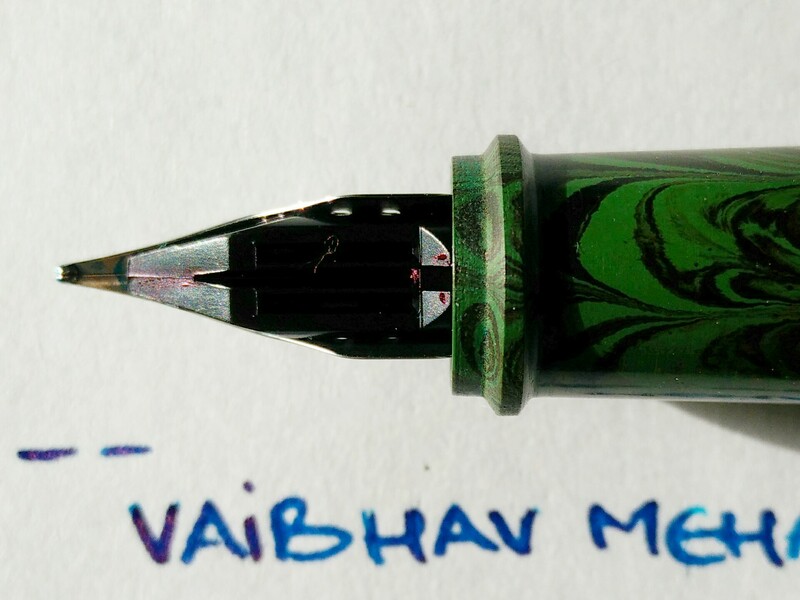 Hi Vaibhav, I have ASA Maya with Fine Schmidt nib , but I am attracted to the nib of Spear. 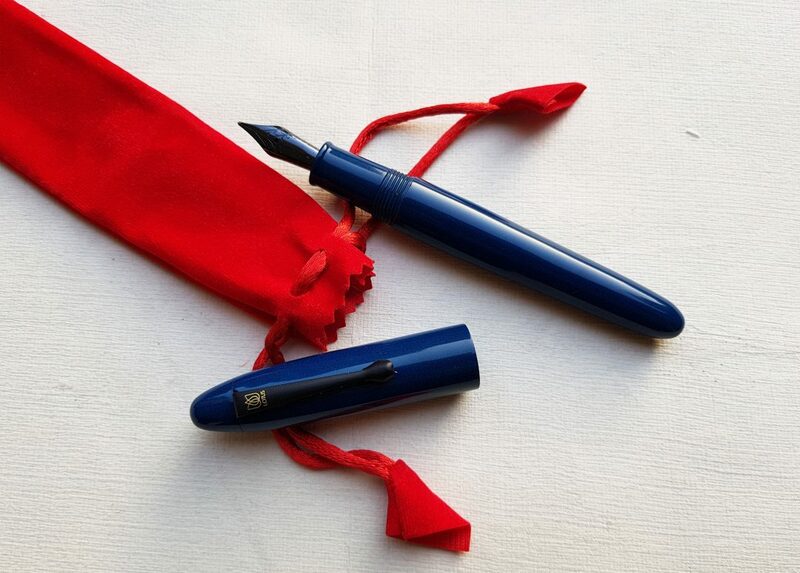 Please tell if its a good buy and I know its bad comparison but how do these ebonite pens compare with Pilot Metropolitan and Lamy Safari ? Vaibhav…excellent review. A question, though…what is the purpose of all the holes in the nib or is it just a design choice? Vaibhav I was about to write a formal review when I saw yours. You have said it all. I feel like suggesting two minor changes to make the pen more valuable. a) The flush design cap has lesser scantling thickness- that makes it not only prone to crack due to hard tightening but the pen-turner could not operate his tap effectively as the thin section expanded a bit when the tap is inserted… this resulted in the threads being only partially deep and during real time use does not engage freely with the barrel threads. Remedy suggested would be to undercut the bottom of the barrel about 8 to 10 mm wide x 0.5 mm deep and push fit a brass or ss band and then carry out the the tapping. That would create good threads and more durability against hard tightening. 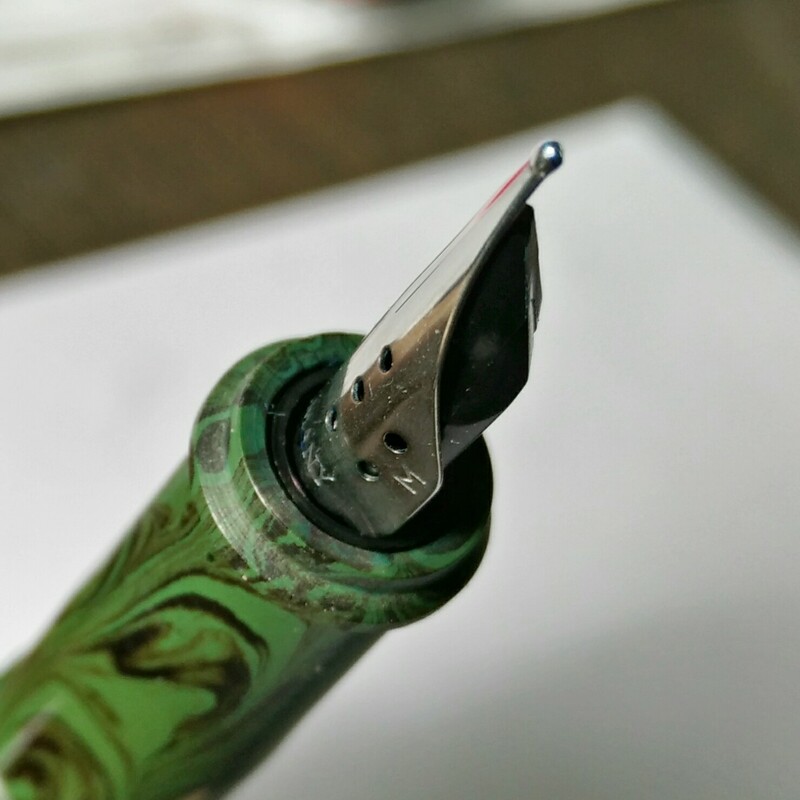 b) Since the nib is 0.45 mm thick stiff steel, the side view of the nib can be improved by shaving off the tip bottom of the feed along the contour of the nib shoulders. This will not compromise in the strength of the combination of of nib and feed. c) The clip should be allowed to sit on a small groove cut on the top of the barrel to fix its movement. 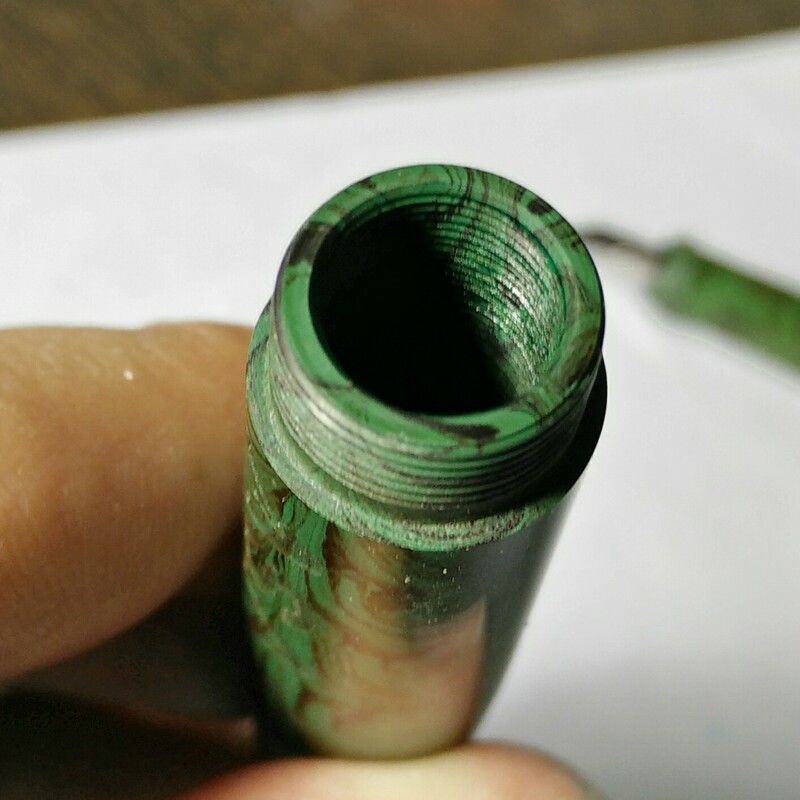 The freedom of turning of the clip will eventually score the contact area on the cap and spoil the beauty of the pen. These three needed mods apart Spear is a lovely creation by ASA pens. That nib looks great. Nice review. As usual, detailed Review Vaibhav. It looks very beautiful. I have to place order but at present they got only light brown i think. 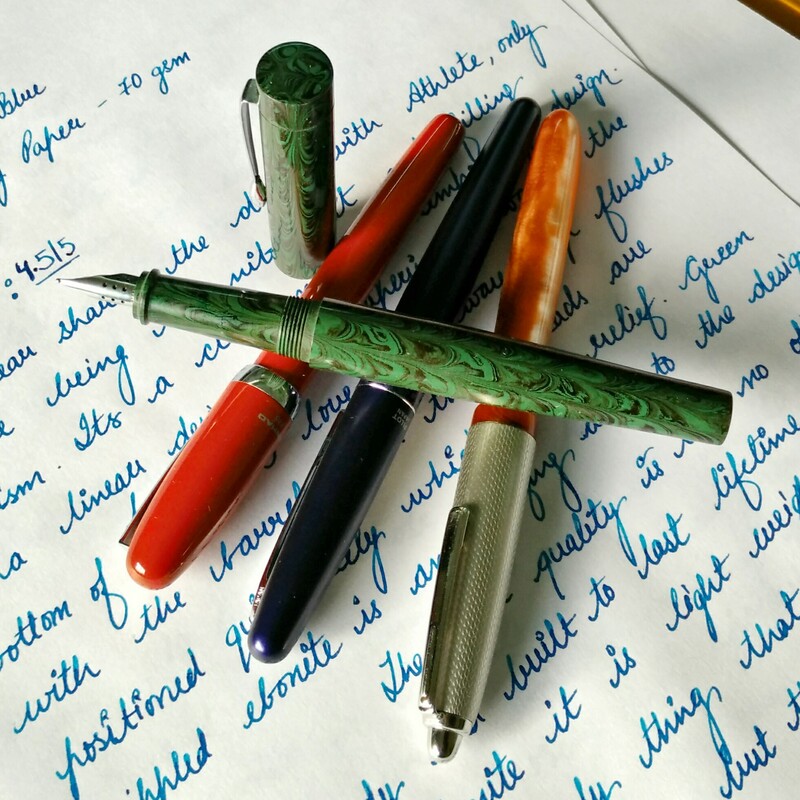 I bought a Patriot with M Nib. 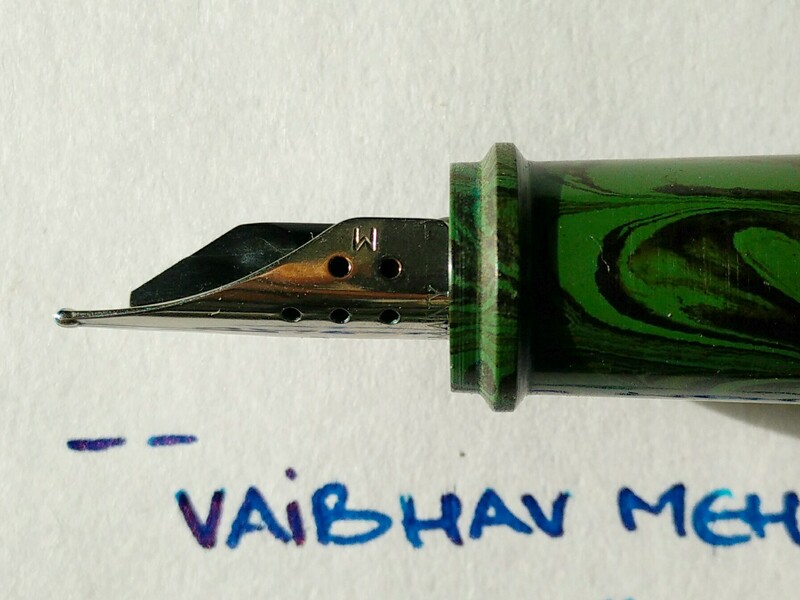 But the Nib is not as smooth as other jowo Nibs. May be ink flow problem and it may take some time I think. (cleaned the section twice). Thank you Vaibhav. What Inks I bought in 2016 ? 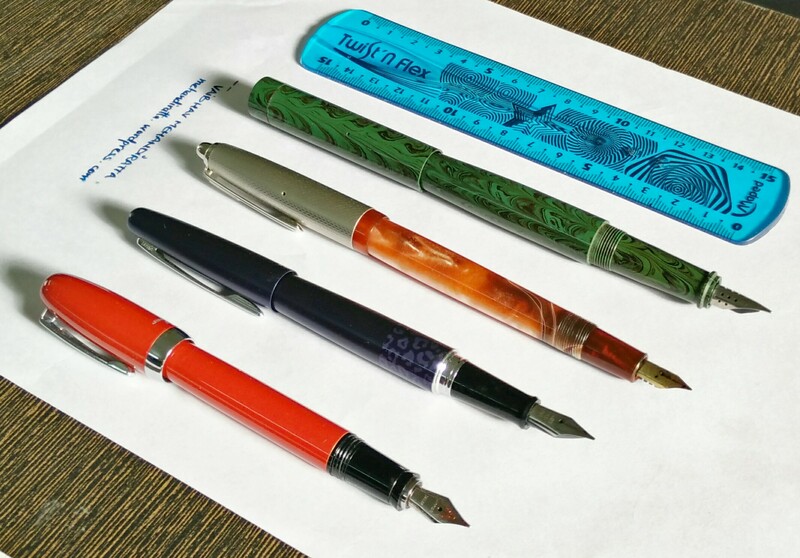 Reviewing inks and fountain pens etc. 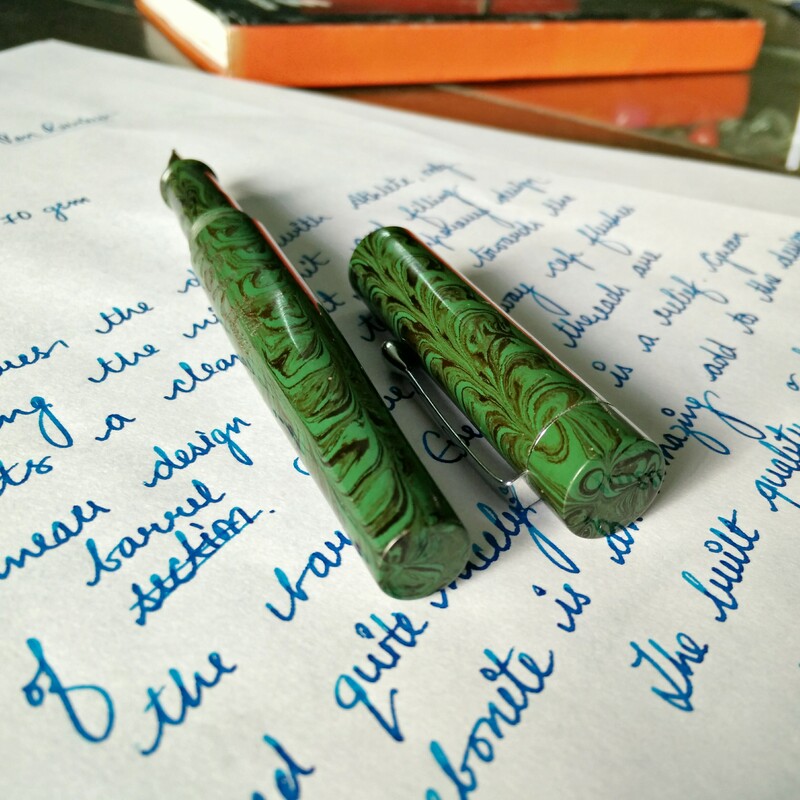 For people who love using, collecting and learning about fountain pens.